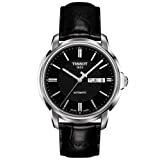 Serving both as stylish accessory as well as precise timepiece, this Tissot watch is the perfect complement to any man’s business wear. Featuring a sturdy 19mm black leather band and held together with a reliable deployment buckle clasp, this watch will stay fastened to the wearer’s wrist without giving them one more thing to worry about during their busy day. The dapper black dial rests beneath a sapphire crystal and showcases sleek silver indices and sharp silver hands. Additional features include luminous, water resistant to 30 meters, and measures seconds.